Safe and effective sterilisation of baby feeding products is essential from day one. It is also essential that retailers offer the type of sterilising products that fit parents’ lifestyles. In an era of fast paced technological advancement, Baby Brands Direct has been firmly keeping up with the latest inventions. Our catalogue offers the best selling brands such as Babymoov, Dr Brown’s, Philips Avent and Tommee Tippee. You can quickly and easily browse through our range of sterilisers, sterilising equipment, bottle warmers and accessories. Discover the newest market inventions in trendy colours, sizes and designs. By choosing to sell only the best, we have been a favourite wholesaler for two main reasons: price and quality. Our clients keep enjoying excellent reputation and growing sales by offering the latest fuss-free feeding gadgets. Looking back in time, warming breast milk was possibly one of the most challenging activities for mums. 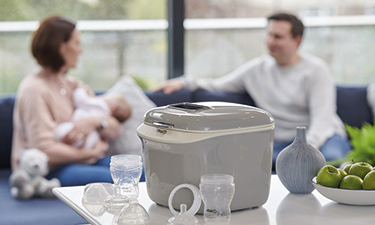 That is where sterilisers and bottle warmers come to play focal roles as the must-haves baby products that make parents’ lives easier. From compact sterilisers to sterilising the whole baby gear, you can showcase a broad choice for your clients. With years of experience, Baby Brands Direct has seen growth in parents choosing premium items. No wonder we chose to sell them too. Grab your clients’ attention by presenting functional and fashionable goods. Shop at your convenience 24/7 and benefit by becoming an ambassador of safe and quality baby products.